On August 5th, the National Agricultural Statistical Service (NASS) released estimates of statewide cash rents and farmland values for 2016. For Illinois, the 2016 cash rent was $221 per acre, down by $7 per acre from the 2015 value. The 2016 land value was $7,450 per acre, down by $200 per acre from the 2015 level. 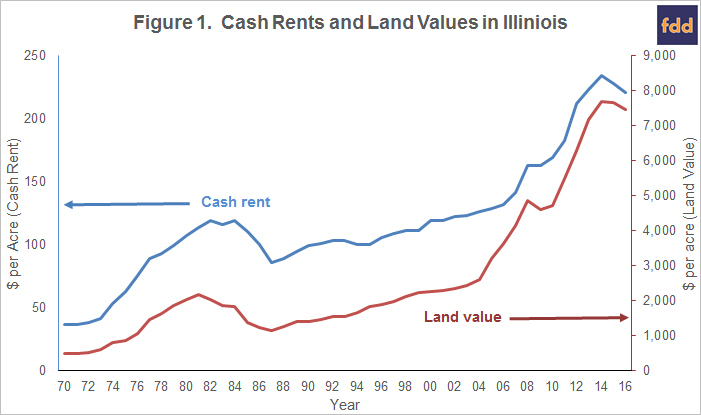 Figure 1 shows average cash rents in Illinois for the years from 1970 to 2016, with the $221 per acre value for 2016 being the most recently released cash rent. As can be seen in Figure 1, cash rents fell during the early and mid-1980s, reaching a low of $86 per acre in 1987. From this 1987 low, cash rents increased to a high of $234 per acre in 2014. Between 1987 and 2014, cash rents increased at an average rate of 3.8% per year. Growth rates were higher between 2006 and 2014 (see Figure 1), during the period of higher commodity prices precipitated by increased corn use in making ethanol, and further strengthened by commodity supply issues in 2010 through 2012. Between 2006 and 2014, cash rents increased an average of 7.4% per year. In 2015, cash rents decreased by $6 per acre to $228 per acre. A further $7 per acre occurred between 2015 and 2016, resulting in the $221 per acre cash rent for 2016. Between 2014 and 2016, cash rents decreased an average of 2.8% per year. Land values showed similar time trends to cash rents, decreasing in the early to mid-1980s, and then increasing from a low of $1,149 per acre in 1987 to a high $7,700 per acre in 2014 (see Figure 1). Between 1987 and 2014, land values increased an average of 7.3% per year. Similar to cash rents, growth rates were higher between 2006 and 2014, with an average yearly increase of 9.8% per year. Land values decreased from the high of $7,700 per acre in 2014 to $7,650 per acre in 2015. Land values fell further to $7,450 per acre in 2016. Between 2014 and 2016, land values decreased an average of 1.6% per year. Corn prices received by farmers averaged $5.07 per bushel in 2010, $6.24 per bushel in 2011, and $6.93 per bushel in 2012. Since 2013, corn prices have been below $4.00 per bushel most of the time. This fall in corn price corresponded to decreases in other commodity prices, and led to per acre revenue being below per acre costs, resulting in the need to reduce costs by about $100 per acre (farmdoc daily September 1, 2015). Some progress has been made in reducing costs: 1) fertilizer prices decreased in 2016 (farmdoc daily June 28, 2016) and 2) capital purchases were reduced which will cause reductions in machinery depreciation over time. Decreases in average cash rents in 2015 and 2016 also aided in reducing costs. Still, reductions in costs occurring up to this point do not result in costs being below revenue. Therefore, a continuing need to cut non-land costs and cash rents exists. Recent declines in commodity prices lead to low revenue projections for both 2016 and 2017, further aggravating the need to reduce costs (farmdoc daily August 2, 2016 ). On average, cash rent decreases in the future must be larger than the $12 per acre decrease that occurred during the last two years if costs are to be below revenue. Cash rent reductions along with continuing prospects of low agricultural returns likely caused lower land values. Up to this point, however, land value decreases have been modest. Higher or rising interest rates likely would have caused a larger decrease in land price. Instead, interest rates on debt instruments have been low. Take yields on ten-year constant maturity Treasuries as an example. Yield on these notes trended downward since 1987 (see Figure 2). From an economic standpoint, decreasing yields put upward pressures on land values. In recent years, Treasury yields have been very low. Ten-year constant maturity Treasury yields averaged 2.5% in 2014 and 2.1% in 2015. Yields for the first six-months of 2016 were 1.8%, below the 2014 and 2015 levels (see Figure 2). 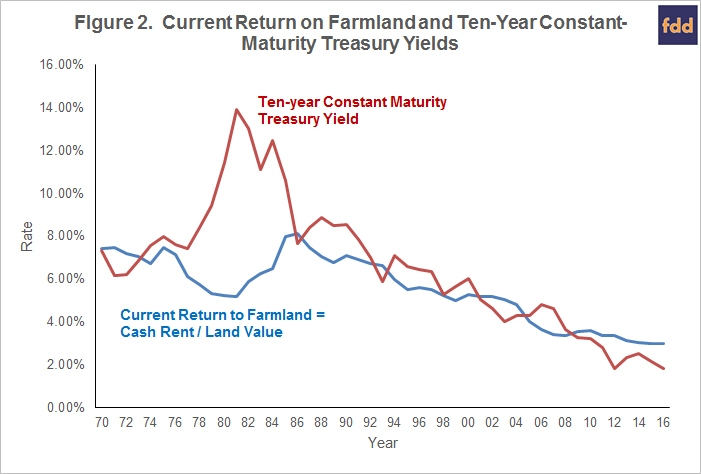 Since 1987, changes in the current return on farmland mirrored changes in the ten-year constant maturity Treasury yield (see Figure 2). In Figure 2, the current return equals cash rent divided by the land value, representing the cash return to farmland stated as a percent of farmland value. This relationship between current farmland returns and Treasury yields is as expected. As returns to safe financial assets decrease, the current return to farmland decreases. Given stable cash rents, current returns as a percent of land value will decrease if land values increase. Reductions in current returns to farmland could lead to reductions in farmland values so that that typical relationships between farmland returns and financial asset returns continue into the future. Given reduced cash rents in the future, farmland values should be expected to decrease. If rates on financial assets continue to be low, land value declines could be modest, roughly mirroring the percentage decrease in financial assets. Any rise in interest rates could lead to larger reductions in farmland values. Both cash rents and land values decreased in 2016. Given current levels of commodity prices, one should expect continued decreases in cash rents and land values into 2017. If rates on Treasuries and other relatively safe financial assets remain low, land prices could decrease at roughly the same rates as cash rents. Rising interest rates could cause larger decreases in farmland values. Schnitkey, G. "Cutting $100 per Acre in Costs for Corn and Soybeans." farmdoc daily (5):160, Department of Agricultural and Consumer Economics, University of Illinois at Urbana-Champaign, September 1, 2015. Schnitkey, G. "Release of Revised 2016 Illinois Crop Budgets." farmdoc daily (6):122, Department of Agricultural and Consumer Economics, University of Illinois at Urbana-Champaign, June 28, 2016. Schnitkey, G. "Corn and Soybean Revenue Projections for 2016 and 2017." farmdoc daily (6):145, Department of Agricultural and Consumer Economics, University of Illinois at Urbana-Champaign, August 2, 2016.